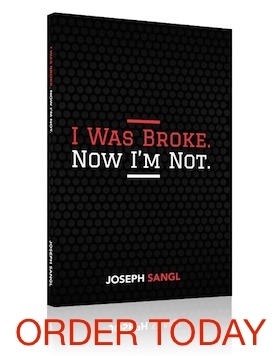 Welcome to the latest series at www.JosephSangl.com – "Are you STUCK?" Have you ever been stuck financially? I mean STUCK. Do you feel so stuck that you can't even gain any traction to get control of your finances? Perhaps you have no income because you have lost your job. Maybe you are in college and accumulating debt to pay for it. Perhaps your spouse spends money faster than you make it. Or maybe you are just lost when it comes to managing money. It might even be the fact that you have so much unsecured debt that you feel that the creditors should just change the amount owed to a cool $1,000,000 because it might as well be that much! Maybe you are disabled, and can't figure out what to do to earn more money. If this is you, this is a series for you! In this series, I will be sharing steps you can take to become unSTUCK. I am FIRED UP about this series. Part One: WHY are you stuck? It is important to understand why you are stuck. There are some situations that have definite ends to them (college) and other situations that have indefinite ends to them (job loss, disability, and overwhelming debt). Write it down on paper. Right now. Write "I am stuck financially because … ". When I encounter situations where I don't know what to do, I start writing. Writing enables me to put all of my thoughts on paper. After writing all of my jumbled thoughts down, I set it aside for awhile. After a day or two, I revisit what I have written and identify the repetitive thoughts. This helps me identify the core issue. Readers: Would you comment on why you are stuck or what caused you to be stuck in the past? I was stuck because of credit card debit and lack of discipline. I could be stuck right now because I recently lost my job; however, because I started listening to your wisdom I learned that I don’t need to buy everything I see. So I’m not stuck. I’m not able to pay extra or get closer to getting out of debt, but I’m not accumulating more debt because I am unemployed and we can buy groceries, etc. If we hadn’t paid off the credit cards, etc. I would be more than stuck right now…I’d be drowning. I am stuck because of a job lost 3 yrs ago!!!!! I have read your book and I am applying to my finances. I work 2 jobs. Things are better but I have a long way to go. At my last job I was living the life..I thought. I made great money but I would spend out of control. Now I make considerable less money with 2 jobs conbined! Worst yet I still have all the bills I had 3 yr ago! My husband is working 3 days a week and our lifestyle has not changed a bit. We are not stuck either. Because of our choices we made a long time ago about saving for a rainy day. Its raining now and we feel secure because we saved for this storm. It could rain for 6 months and we wouldnt get wet. The things Joe teaches are the Bible truth. If you apply them then you too could dance in the rain. I am stuck because I was stupid enough to co-sign on my ex Boyfriends student loan and he has opted not to pay it. My life feels like it is in the shambles. I was unable to pay on it or any of the other debt we aquired together because my life has gotten in the way. Since i left that man I came home and my brother became very ill and out of our family is was my job to care for him. He has since passed, but I feel overwhelmed everytime I try to take care of my problems.They have defiantely snowballed into an avalanche and I can’t get out. Please pray for me as I do not know where to begin.